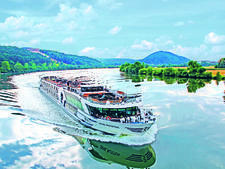 Established in 1984, Riviera Travel has grown into the U.K.'s largest provider of European river cruises, and also offers sailings in Asia on chartered ships. 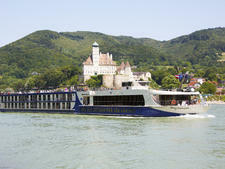 Its vessels carry 88 to 144 passengers, ensuring high levels of personal service. The U.K.-based company operates 12 vessels on 10 European rivers -- the Danube, Main-Danube canal, Main, Moselle, Rhine, Rhone, Seine, Douro, Dutch waterways and the Saone. 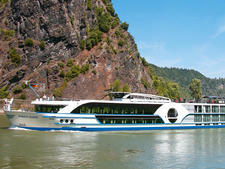 Offering a quality product at a value-for-money price, cruises are now also targeted at U.S. and Australian passengers. The line's "Britishness" can be seen in tea and coffee-making facilities in all cabins -- a rarity on river vessels -- and tipping is discretionary, with an envelope left in all cabins. The onboard language is English. Fares cover return travel and transfers, all meals onboard, excursions and guided tours, taxes and fuel supplements. Riviera Travel has consistently won awards for outstanding service, industry-beating quality and exceptional value and is the only brand to concurrently hold three awards from the U.K. consumer organization called Which?, including 2017 Travel Brand of the Year. The company unveiled four new ships in 2017 -- with two more to follow in 2018 -- plus new cruises itineraries: Amsterdam, Kinderdijk & the Dutch Bulbfields, Budapest to the Black Sea and the Enchanting Rhine & Yuletide Markets. With a typical 4:1 passenger-to-crew ratio, the vessels carry fewer passengers (nearly 50 percent less in the case of the Swiss Ruby) than other similar-sized ships catering for up to 200. This provides more public space as well as a smaller, more intimate dining experience. Days begin with an early risers' breakfast of tea, coffee and pastries, followed by a full breakfast buffet with made-to-order items. Room service is offered for continental breakfast and complimentary tea and coffee are available throughout the day. Lunch is also buffet-style, followed by afternoon tea and a waiter-service four-course dinner. The welcome dinner features an extended menu and the captain's gala dinner features specialities from the countries and regions visited during the cruise. In addition to the main restaurant, newer vessels such as the Thomas Hardy have a bistro restaurant, with alfresco seating for 24 diners. There are daily presentations and excursions included in the cruise fare, and a packed lunch is provided on full-day excursions. Onboard amenities featured on some of the ships include a sauna, steam room, whirlpool, splash pool, hair salon and spa. Design details include environmentally friendly materials, such as tropical hardwoods combined with wrought iron, copper, brass and soft leather furnishings. Riviera Travel also sells Mekong cruises with an escorted tour of Vietnam and Cambodia on the 27-cabin Jayavarman and 32-cabin Mekong Prestige II, in addition to ocean cruises on Star Clippers' masted sailing ships, Royal Clipper and Star Clipper. Riviera targets the U.K, U.S. and Australian market and most passengers -- many of them repeat passengers from the U.K. who have been loyal to the company for many years -- are over 50. The Riviera Travel river fleet expanded in 2017 with the addition of three new mainland Europe-based vessels. These include the identical Thomas Hardy, Emily Bronte and Oscar Wilde, featuring all-suite cabins, each carrying 169 passengers and 44 crew. Two additional new ships to launch in 2017 -- the 126-passenger, 36-crew Douro Elegance and Douro Serenity -- are based on Portugal's Douro River. Next year will see the addition of Robert Burns, another new-built ship by Swiss shipping company Scylla AG, carrying 140 passengers. Riviera Travel's fleet also includes the 140-passenger Jane Austen and Charles Dickens, which launched in 2015. Owned and operated by Riviera's partner, Scylla AG, and designed to Riviera's requirements, the fleet also includes: Swiss Ruby, launched in 2002, carrying 88 passengers; and Douro Spirit, carrying 128. All the other vessels cater for 140 passengers, including Swiss Corona, launched in 2004; Swiss Tiara, launched in 2006; Lord Byron, launched in 2013 and William Shakespeare, launched in 2014. 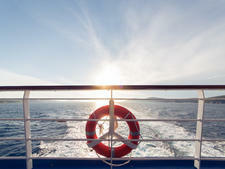 A cruise line dedicated to making you itinerary as packed with no important-attraction-stone left unturned. Each excursion is specifically planned to make sure the cruiser misses nothing key to their experience on shore.